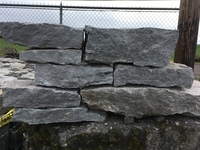 Natural Stone for Landscape and Masonry Constuction SPECIAL OFFERS! From time to time we offer specials on various materials that we decide to discontinue for one reason or another and those go to the CLOSEOUT section of our yard. We also sometimes get great buys from our suppliers and pass those savings on to our customers and will intemittently list those in this section of our website. PLEASE NOTE THAT ALL SPECIALS ARE SUBJECT TO STOCK ON HAND - FIRST COME/FIRST SERVED.